Having no morals must be a prerequisite for being a Torie. WARNING: The images in the above artical are horrific. I’m subject to Bedroom Tax, however I’ve been trying to move for 3 years, I’ve been offer a house. No assessment of my needs has been done. ‘Bedroom tax’ – one year on, is it working? Short answer NO – but the DWP new that! The Prime Minister voiced his opposition to introducing means testing for winter fuel payments, free bus passes and free ­television licences. This unprovoked attack on pensioners come the week after the DWP was exposed for fake benefit claims published on leaflets. It would seam lying is second nature to IDS. These lies would (or should) make his entire political career a lie at best fraud. I’m not sure of the delay what are the afraid of ? If I i ever had the misfortune to meet IDS I feer I might be arested! I hade a “fit note” it was ignored by my employer! I used the “Work is good for your health” again ignored. So the head of the DWP has no idea what’s going in his own department. Nice to know where getting value for money. 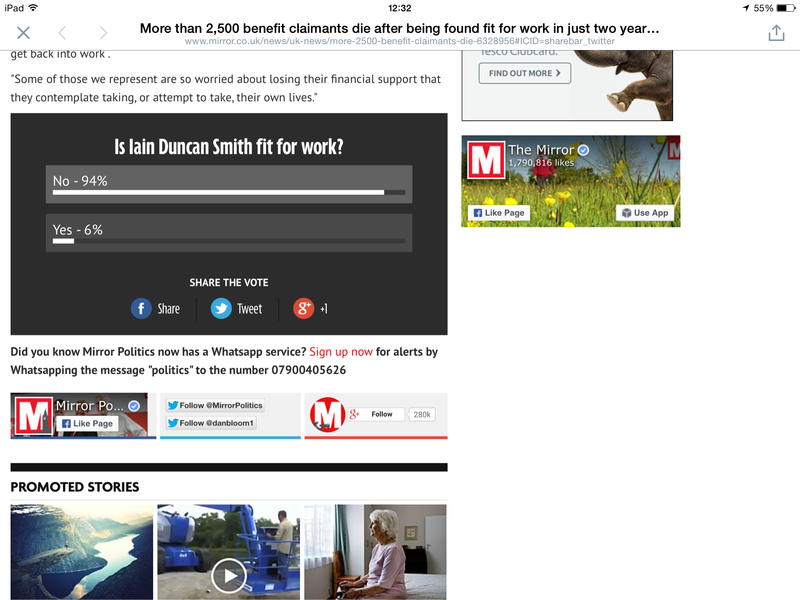 The Secretary of State for Work and Pensions (Mr Iain Duncan Smith): I thank the hon. Lady for her question and for her campaigning in this area. I would like to take this opportunity to offer her my condolences, having not spoken to her before.